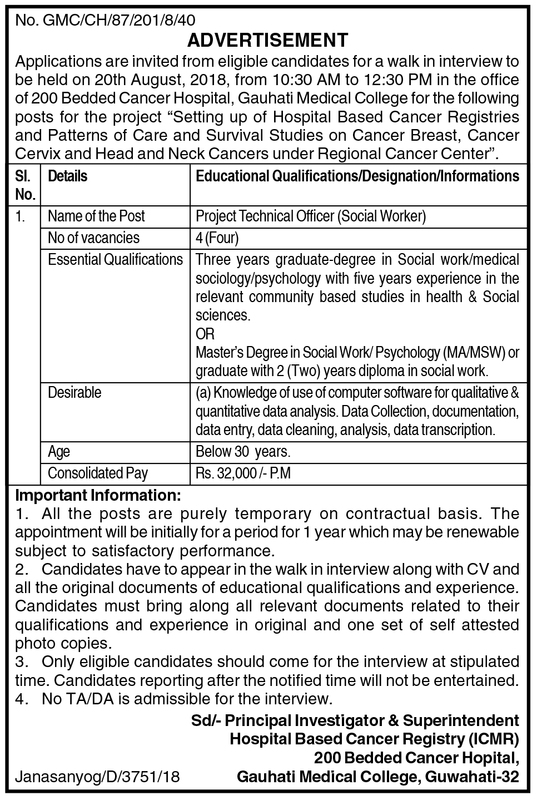 Applications are invited from eligible candidates for a walk in interview to be held on 20th August, 2018, from 10:30 AM to 12:30 PM in the office of 200 Bedded Cancer Hospital, Gauhati Medical College for the following posts for the project “Setting up of Hospital Based Cancer Registries and Patterns of Care and Survival Studies on Cancer Breast, Cancer Cervix and Head and Neck Cancers under Regional Cancer Center”. Educational Qualification: Three years graduate-degree in Social work/medical sociology/psychology with five years experience in the relevant community based studies in health & Social sciences. Master’s Degree in Social Work/ Psychology (MA/MSW) or graduate with 2 (Two) years diploma in social work. Desirable : (a) Knowledge of use of computer software for qualitative & quantitative data analysis. Data Collection, documentation, data entry, data cleaning, analysis, data transcription. How to apply: Candidates have to appear in the walk in interview along with CV and all the original documents of educational qualifications and experience. Candidates must bring along all relevant documents related to their qualifications and experience in original and one set of self attested photo copies. Address: Principal Investigator & Superintendent, Hospital Based Cancer Registry (ICMR), 200 Bedded Cancer Hospital, Gauhati Medical College, Guwahati-32.